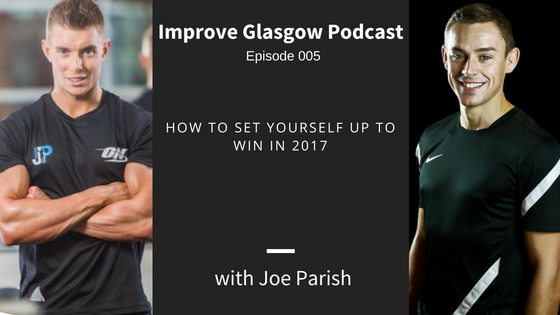 Episode 005 of the Improve Glasgow Podcast is LIVE! In this episode Ross Stewart welcomes Joe Parish, of JPhysique, into the gym to nail down the best pieces of advice they could muster for people starting their fitness journey in January. Joe is a Personal Trainer, online coach, physique competitor, powerlifter and just an all round good dude. He’s making some big waves in the UK fitness industry at the moment and had a ton of valuable stuff to say. So much so that a second appearance on the podcast most likely won’t be too far away. – The importance of having a ‘why’ to keep you motivated when times get tough and/or progress slows down. Thanks to Joe for taking the time out of his day to come visit…and for nearly putting a hole in our floor after deadlifting 235kg.